Matthew Stevens was in impressive form as he thrashed Ronnie O'Sullivan 5-0 to reach the last eight of the LG Cup. O'Sullivan, who had cruised into the third round with a 5-0 win over Dave Harold, was this time on the receiving end against the ruthless Welshman. Stevens, the world number nine, won in just 73 minutes with O'Sullivan taking just 30 points in the contest. "I hope he goes on and wins it. He deserves to. 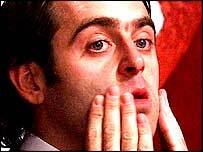 He smashed me to bits," said O'Sullivan after the match. I made hard work of it, but that's the way it goes sometimes. "I've got faith in my own game though. He won the first four, but I could have won a few and come back. "I just got trounced, it was like the Chris Small game last year when I was beaten heavily." Stevens, who made breaks of 51, 72, 52 and 54, was understandably delighted. "It was a great result for me," he said. ""My long-potting was good and three of the frames I won were because I got in because of that. "Ronnie could have easily done it to me, but I'm playing to win this tournament." Stevens will play John Higgins, who was in devastating form as he brushed aside Shaun Murphy 5-2. The world number four turned on the style with breaks of 54, 93, 59, 82 and 84. Earlier, world number one Mark Williams was forced to dig deep to defeat Thailand's James Wattana and reach the quarter-finals. The Welshman battled back from 3-2 down to see off Wattana 5-3 in Preston. "Wattana looked good when he got in, but he missed important balls and that gave me a chance," said Williams. The world champion will now face either Barry Hawkins or Allister Carter for a place in the last four. In an evening game, John Parrot continued his impressive form by beating Lee Walker 5-3. Parrot built up a comfortable lead but was forced to respond to a fightback by his determined opponent before securing the win.